Besides the Bermuda Triangle there are many other mysterious sites in the world that have witnessed disappearances of planes and ships. The Lake Michigan Triangle is one such site. Many stories have been told about the Michigan Triangle, about the disappearances of land and sea craft, UFO sightings, appearances of strange creatures and no explanation is found for any of the stories. The Michigan Triangle is in the middle of Lake Michigan between Ludington and Benton Harbor, Michigan and to Manitowoc, Wisconsin. Many stories have occurred there to make people believe that the lake is a site of supernatural happenings. The stories began in 1891. On 21st May, a schooner named Thomas Hume disappeared along with its seven sailors while sailing empty from Chicago to Muskegon. The lake was thoroughly searched but not even a stick or a piece of wood of the wooden boat was ever found. The disappearance still remains a mystery. Later in 1921, eleven people inside a ship Rosa Belle went missing. All the missing people were members of the Benton Harbor House of David. The ship was found overturned and floating in the Michigan Lake. It appeared that the ship must have with collided another vessel. No other ship that had reported of collision and no other wreckage was found. The mystery of Rosa Belle was never solved. On April 28, 1937, Captain George R. Donner of the O.M. McFarland disappeared mysteriously from his ship when it was passing through the Triangle. Captain Donner was going to Port Washington, Wisconsin from Erie, Pennsylvania. On the way comes the Michigan Triangle. According to the story captain Donner was tired and went to his cabin for a nap, telling his second mate to wake him up on reaching their destination. After a few hours when the second mate went to look for Donner, he was not in the cabin. The door of the cabin was locked from inside. The other sailors searched the ship everywhere but Donner was never found. 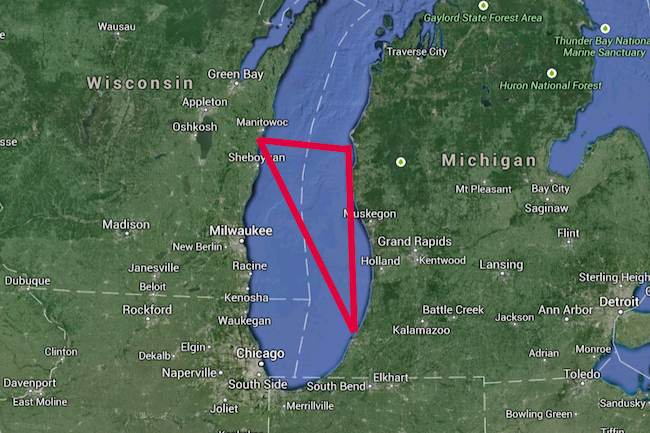 It is said that at the time Donner went missing, the ship was traveling near the midpoint of the Michigan Triangle. On 23rd June, 1950, the Northwestern Airlines flight 2501 took off from New York with 3 crew members and 55 passengers for Minneapolis. Robert C. Lind, an experienced pilot was flying the plane. Later that night because of bad weather when the flight was near Chicago, it changed its course to northwest direction over Lake Michigan. From there the plane vanished with its 58 passengers. It is said that around midnight Lind had requested permission to drop altitude from 3500 ft to 2500 ft. His request was not accepted and this was the last communication the flight had made. The plane was flying above the lake when it vanished. No wreckage was ever recovered despite the use of sonar and divers. The stories about the wreckage found differs from source to source. Some say nothing was found, some say a blanket bearing the logo of the plane was found. It was clear that the plane had crashed in the lake. The reason of the crash is still a mystery. 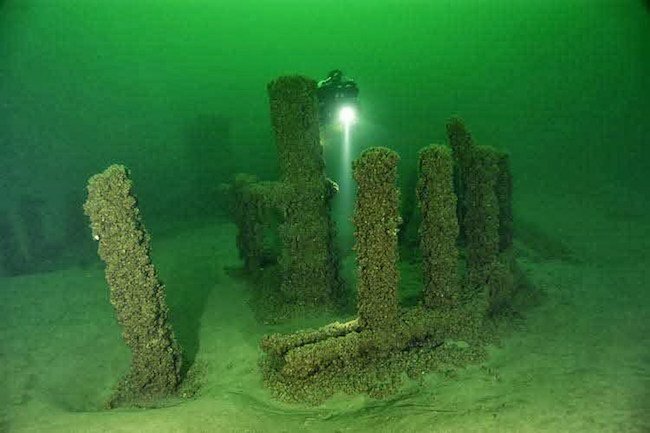 While scanning the waters of lake Michigan for ship wrecks, in 2007, Mark Holley an underwater archaeologist found a mysterious pattern of stones 40 feet deep in the lake. One of the rock had a carving of mastodon. (Mastodon is an elephant like animal that has been extinct for more than 10,000 years.) These circle of rocks must have been placed by the ancient man before the lake was formed. Surprisingly the rock formation resembles the Stonehenge found in Europe. These formations are quoted as the North American Stonehenge and its said that they may be responsible for the disappearances. In 2000, on 22nd May there was a report from the air traffic controllers of the O’Hare International Airport in Chicago, Illinois that from the past five weeks they have been seeing images of ghost planes on their radar sets in the skies of the Lake Michigan Triangle. The ghost planes had become a complete terror for the air traffic controllers. They had to order many pilots to take sudden turns to avoid crashing into the appearing planes on their radar and this involved big risks. There are many stories of unidentified flying objects seen near the triangle. The Michigan Triangle is considered as a hot bed of UFO Sightings. The latest reported was on 29th August 2013. A witness saw many unknown objects moving in a controlled manner. Disappearances of ships, air crafts, UFOs, ghostly planes all these unexplained stories makes the deep waters of Lake Michigan a big mystery.